Shrewsbury—Joe Marinelli uses the word “refresh” a lot. He applies it not only to the way carpets, furniture or tile and grout look when his cleaning company finishes its work, but also to the way that work makes customers feel. “Clean is a state of being. People feel refreshed when they snuggle their toes into a clean carpet,” said Marinelli, who started the company, JoeCleans, with his wife, Robin, over 35 years ago. JoeCleans specializes in major cleaning projects that need doing periodically; the company does not offer routine housekeeping service. JoeCleans serves customers primarily within a 15-mile radius around Shrewsbury. When JoeCleans tackles carpet cleaning, the crew moves all the furniture to get the work done. The firm is experienced in dealing with stains caused by pets. It also cleans area rugs, either in the customer’s home or in the shop with free pickup and delivery. “We love Oriental rugs,” he added. A thorough tile and grout cleaning “is something most people can’t do easily because they don’t have our equipment,” he said. Drapes, curtains and installed cornices over windows can be cleaned where they hang. First they are vacuumed, then cleaned with a dry cleaning process that works without leaving the fabric wet. JoeCleans will clean both upholstered and leather furniture. 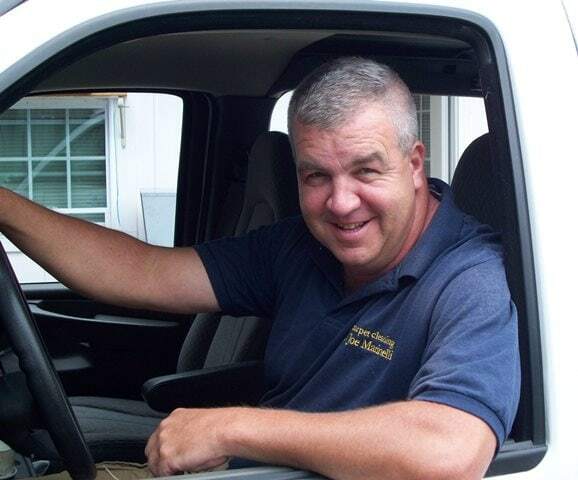 JoeCleans also provides similar specialty cleaning services to area businesses. In addition, nightly janitorial service is available to businesses. Marinelli also works with subcontractors to provide services such as window washing and duct cleaning to commercial customers. Marinelli believes in giving back to the community that has kept his business going. Last Earth Day, the crew participated in a litter patrol and collected 50 bags of trash from area roadways. At Christmas time, he offers gift cards to customers that they can use as discounts on future purchases or give as a gift. A new project, Clean It 4ward, will begin in early summer. “We are going to launch a campaign in which people can nominate someone who has made significant contributions to the community for a free cleaning. It might be a coach or a neighbor or anyone who donates their time to the community,” Marinelli said. A panel of community leaders will be recruited to screen the nominees. When the program begins, information on requirements and a nominating form will be available on the company’s website, www.joecleans.com. For more information on the services JoeCleans provides and for cleaning tips, visit the website, www.joecleans.com, or call 508-845-0229.